As many of you know, there was a fire at Abby and Justin’s house in the early morning of February 10. Abby and the kids were out of the home at the time, but sadly, Justin was home and was killed in the fire. As Abby and her children are reeling from this tragic loss we want to rally family, friends, and their communities to support them in the coming days, weeks, and months. Not only will Abby need to start over with all the necessities for her family, she also has the added stress of planning Justin’s funeral, income loss from missing work, Justin’s lost income, and money for a new rental home for her family. She met with the Red Cross today and although they can offer some immediate assistance ($375), that doesn’t come close to covering the needs of this family. The house was a total loss and they didn’t have renter’s insurance. Abby will need clothing for herself and the kids (sizes listed below), furniture, beds, bedding, shoes, kitchen wares, toiletries, etc. If you have any of these items to donate you can bring them to Abby’s parents’ house in Green Lake or Justin’s mom’s house in Princeton. These are their most basic needs but they are also grieving toys, games, treasured Christmas ornaments, photo albums, memorabilia, mementos, and Olivia lost over $800 she had been saving for the past few years for her first car. There are many layers of loss and many layers of grief that they will continue to process over the weeks and months to come. 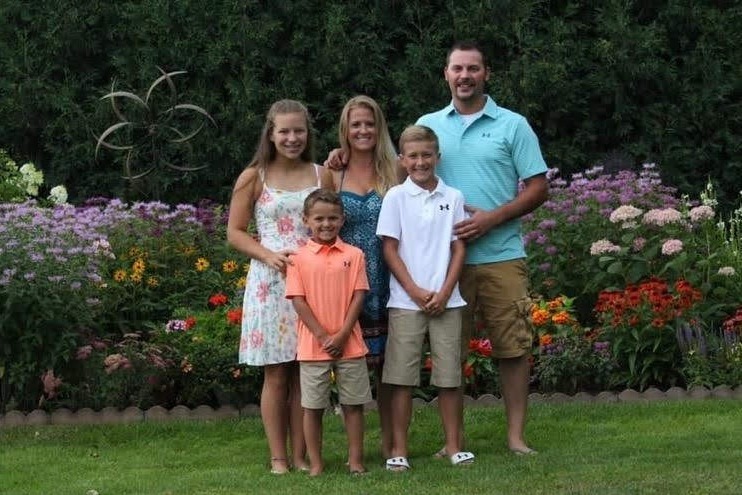 Abby and Justin’s family is lucky to be part of two small towns (Green Lake and Princeton) and we know they will want to support them in any way they can. Please help by making a physical or financial donation. Let’s wrap them in love during this extremely difficult time. a part of. We are immensely grateful for the generosity and expressions of kindness we have received during this difficult time in our lives. Although our hearts are hurting, they are filled with gratitude from the outpouring of help and support from prayers, cards, flowers, food, donations, benefits, and more; we are in awe. Thank you to everyone who was able to come out in the snow and cold to offer their sympathies to Abby's and Justin's family. The whole place was packed and the line wrapped around the corner. Justin was deeply loved and will be greatly missed by all who knew him. Abby was dreading the day but your love and support buoyed her and she is so grateful for it. Speaking of grateful...When I think about all of the money raised, donations given, sympathies sent, help offered, and love shown I am absolutely stunned by what has happened in the past week. While we created a bubble for Abby's and Justin's family to grieve you all showed up for them in grand fashion. Please know that every single item donated, dollar given, kind word said is helpful and heard and appreciated. Today begins a new chapter in this journey that will last for many weeks, months, and years. The whirlwind of taking care of the logistics when a loved one dies is ending but that often means that the heavy cloud of grief will set in. Of course Abby's and Justin's family will continue to grieve but we want to continue to let them know that we are there for them. There to give them space, there to give them company when they need it, there to take care of tasks, there to share memories, there to share a laugh or a cry. Thank you to everyone who continues to send in their donations. Many have asked about Abby so I thought I'd send a brief update. Abby isn't really aware that this is going on behind the scenes. She is doing her best to get through each minute and of course her grief is all over the place. She's been able to laugh at stories and memories but mostly she's just so devastated for her life since Saturday night and of course for Quinn who seems to be starting to grasp what's going on in the only way a 7-year old can. He's clinging to his mommy. Some people have asked about dropping things off at a time when Abby is available. She is completely overwhelmed as you can imagine. She hasn't really wanted to see people other than close family and friends so it really is best to drop off donations at the house during a time that works for you. Donations can be left on the front porch or in the garage. Please know what we are so incredibly thankful for your generosity, even if we can't come out to greet everyone in person. As you can see, we've surpassed our original goal of $20,000 and are now inching our way toward our new goal of $30,000. We want to really do our best to relieve Abby of the financial burden that often comes after the death of a spouse. Thank you to each and every one of you who has contributed. If you would still like to help out please share the link. We've received donations from complete strangers, which is so heartwarming and inspiring. Click on the link below to read Justin's obituary and get information about the service on Sunday.